Random kit checks will be carried out on the morning of the race, if you are missing a mandatory item you will not be allowed to Register or Start. Running shoes (or walking boots). Road running shoes will suffice if conditions have been reasonably dry. Hydration bladder and/or water bottle – minimum 1000ml capacity but we recommend up to 2 litres subject to your personal needs with the forecast weather. Water: We recommend you leave each Pit Stop with your bottles and/or bladder full. separate sterile absorbent material (eg gauze or gauze bandage). Spare Food – Min 400kcal (about 4 gels or 2 flapjacks): Always plan to have excess. Full waterproof body cover – i.e Long sleeve jacket or top and full length trousers. Both must be waterproof. These items are for if you need to stop and wait for assistance – they will help keep you comfortable. These must have TAPED SEAMS as a minimum standard. See image below for what we will be checking. Essential Event Information (supplied at registration). This document includes the Event Organisers Course & Medical Contact Numbers. We recommend you programme then into your phone. Rear red light, or reflective patch (min 10cm x 2cm or equivalent area). RAT RACE STORE can help fill any gaps in your Kit List. 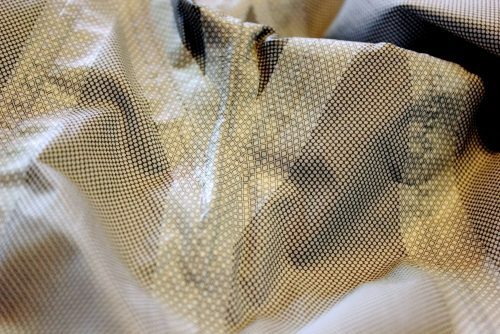 Above: Close up picture of a jacket constructed with waterproof taped seams.